You may have seen the work of architect Marco Casagrande here before—his Walking Barns series in Finland or his Chen House in Taiwan. He is now involved in a project in Taiwan called Ruin Academy. “Ruin Academy is set to re-think the industrial city …. The research and design tasks move freely in-between architecture, urban design, environmental art and other disciplines of art and science within the general framework of built human environment… The Ruin Academy occupies an abandoned 5-story apartment building in central Taipei. It seems impossible to find completely unadorned industrial design like this new (or even pseudo-industrial, since this lamp was probably made for the domestic market). It’s a vintage midcentury modern lamp from Furniture-Love.com via plastolux. It is here if you just need one, and can afford it. 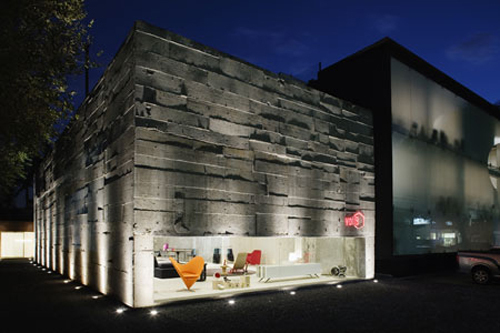 This is the Mi Casa VolB showroom in São Paolo, by Marcio Kogan. I love cast concrete, especially here where there’s no attempt to embellish or hide the structure. Via Wallpaper: “The concrete is visible throughout, free of detailing, with even the construction workers’ chalk markings left intact inside.